Excited and a wee bit apprehensive. A new school year. A new bunch of kids. An adventure. Take the short-cut between the demountables. What state will my room be in? Things are always moved for holiday cleaning! I’ve set aside four days to organise my room and prepare materials for the arrival of the children. Time to think, plan, experiment and create. The physical environment of a classroom reveals what a teacher believes about how children learn. Walk up two flights of stairs to my room. Put down my bag, insert the key and open the door. What will I see? Turn on the lights. Look around the room. 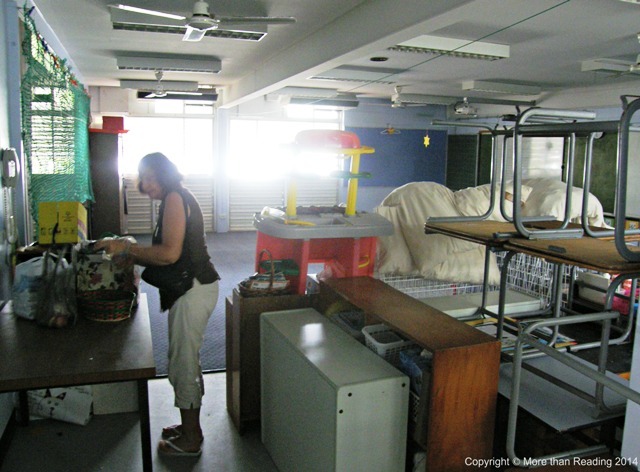 Can’t miss the big pile of furniture – small tables, chairs, shelves – off to one side. 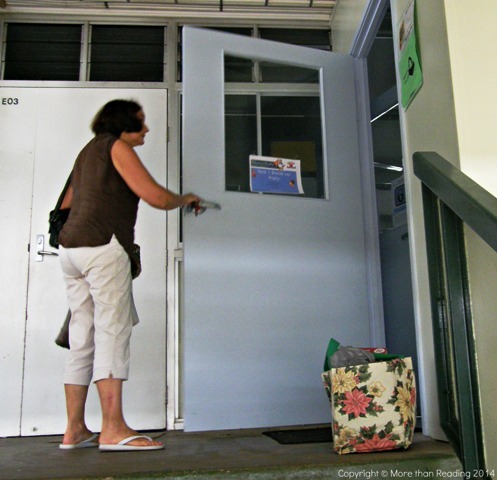 Folding doors that separate the two classrooms are open. 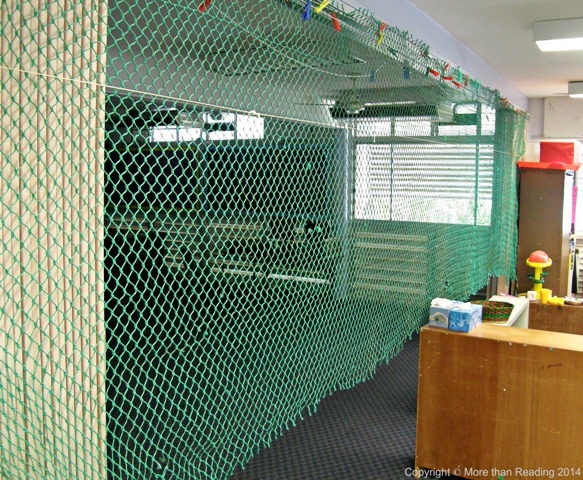 The fishnet ‘word wall’ that stretches across the doors is intact. Wonderful! 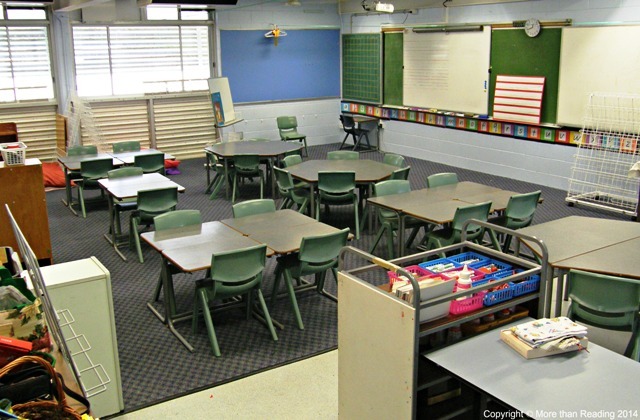 Most of the room is clear – a clean slate on which to design our learning environment. Perfect! Can’t wait to start moving things. When I start the year in a new classroom I make a rough sketch and label possible class areas. But it’s my third year in this room and the sketch is in my head! One year I did a ‘proper’ plan of the classroom for my Doctoral Thesis in 2004 – not to scale! 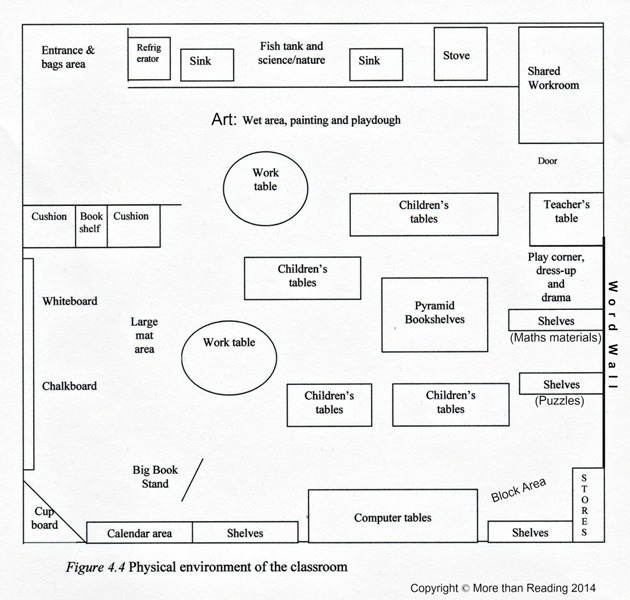 Plan of a classroom physical environment. Different room. Different stationary items. Different layout. The mat area is what makes my classroom ‘tick’. The placement of the mat area is determined by the whiteboard (for shared writing, explicit teaching and teachable moments), the screen (for a ceiling-mounted data projector) and a large display board that becomes the calendar wall. Presto! Class mat area. for shared literacy and learning practices. That’s easy. Two long shelves for backpacks and hats are near the classroom entrance. The refrigerator stands against a nearby, out-of-the-way wall. That’s easy. One printer and a bank of four computers are near electrical outlets and internet connectors – although wireless technology makes a difference now! 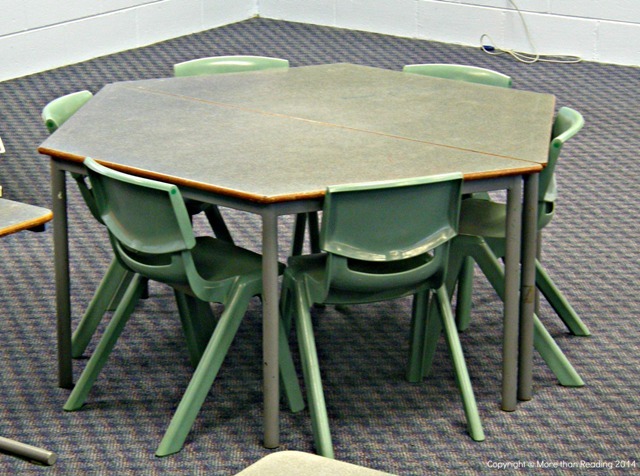 Some older classrooms don’t have enough power outlets – for a laptop, data projector, fish tank, CD player, electric pencil sharpener, battery rechargers… power boards may solve outlet problems but be aware of safety issues: no loose cords across the floor for children to trip over. Another easy one. My art area is a wet area with vinyl floor, sink and counter. I add a collage trolley, a painting easel and tables for playdough/clay and collage. Two wires are strung across the room about a metre below the ceiling. Wonderful! Peg up and display children’s work – paintings, drawings and writing. Display boards are on several walls for longer term displays. The fishnet word wall stretches in front of the folding doors – these will be closed before the classes arrive. 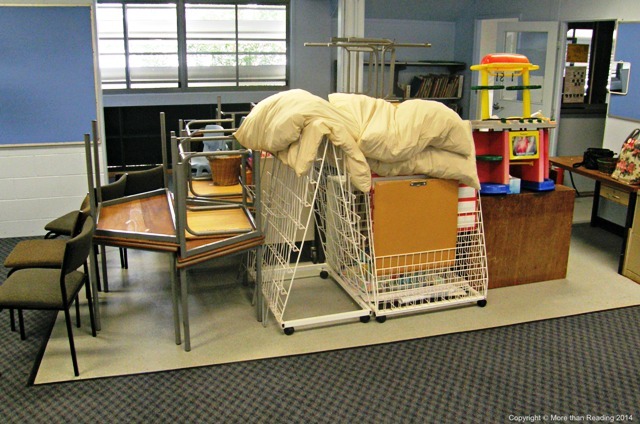 Once again, dig into the pile of furniture to construct the remaining class areas. Be creative! 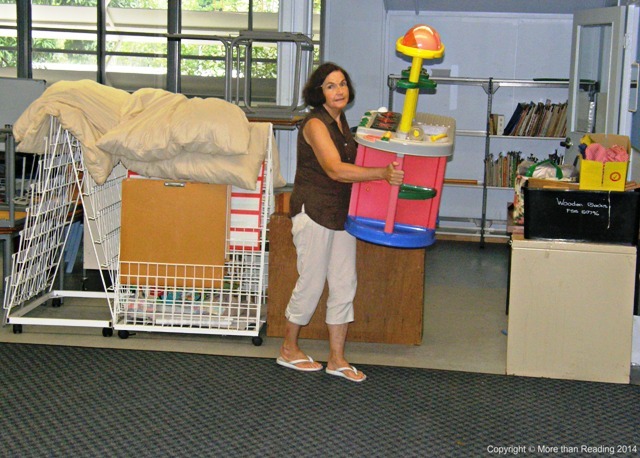 Lifting, dragging, pushing – bit by bit the pile shrinks. *construction materials: buckets and boxes of mobilo, lego, duplo, etc. Reflection: bigger area or smaller area? Last year it never seemed big enough. Can’t find anywhere else to put the out-of-the-way defined space (roads and buildings are often left up over days and nights so the area cannot be in a class walkway). Make the block area bigger? Make the maths-shelves area smaller? Yes. 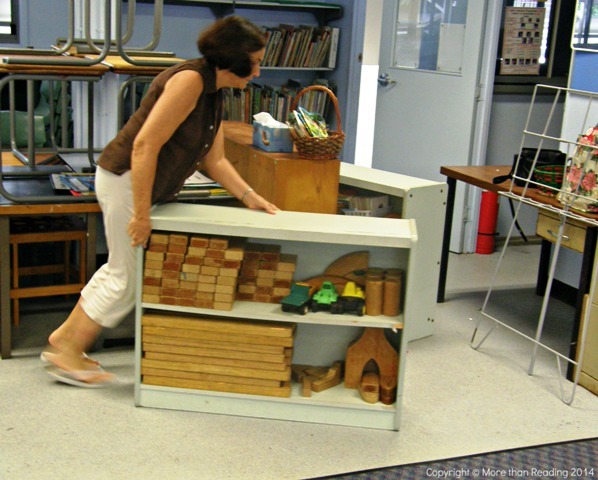 That’s OK. Children don’t ‘work’ in the maths area – they take materials from the shelves and work at tables or on the floor. Decide on the block area. Do not want to move the ‘blocks’ shelf too many times! Block area done. Maths shelves done. Home corner done. Bookshelves and reading area done. Mobilo, lego, constructions and puzzles – not yet done. where children sit, read, rest and talk. 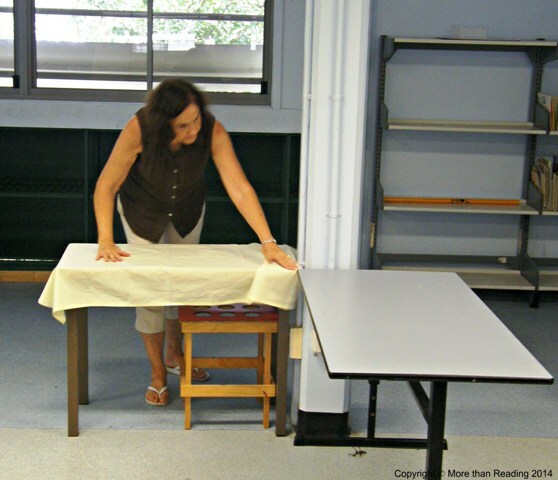 Place tables and chairs where children will ‘work’, putting tables together to make hexagonal tables or clusters of rectangular tables. 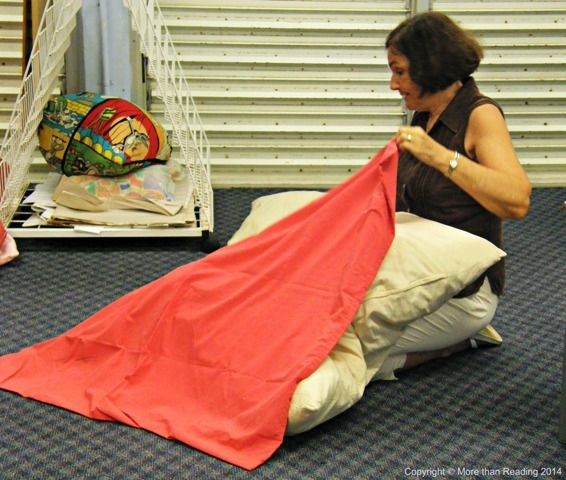 share – essentials in my beliefs about how children learn! Finally… the pile of furniture has vanished! The last table finds a home in the science /discovery area. Improve the tatty table with a cream, cotton cloth. That’s better! Construction materials, like lego, duplo and mobilo are still without a home. Maybe tomorrow? The physical environment of the classroom is taking shape. Tomorrow, sort materials, put in their places and create the calendar wall for ‘real world’ maths. Stop by the office. Pick up my class list. Check for familiar names – wonder if there are younger brothers or sisters of children in previous classes? Tomorrow, use the class list to make name charts, name cards and class book pages for the children’s first day. But now, put the list away. It’s time to go home. Starting School Series, Part 2: Sorting materials and making a calendar wall.